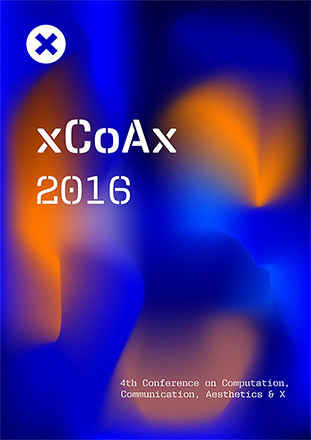 xCoAx 2016: Fourth Conference on Computation, Communication, Aesthetics and X.
xCoAx 2016: Proceedings of the Fourth Conference on Computation, Communication, Aesthetics and X. Includes works from Agustina Andreoletti and Alice Rzezonka; Rodrigo Hernández-Ramírez; Romi Mikulinsky and Yanai Toister; Anna Daudrich; Catarina Lee and Luísa Ribas; Pedro Cardoso; and Hanns Holger Rutz. Of course, all images that we see, are analog. 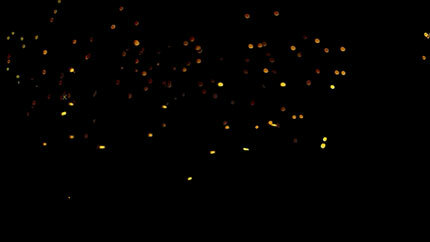 Otherwise we could not see them. But we call them digital. Analog is their surface. Digital is their subface. The subface wins: it has driven the masterpiece out of the world of art. For the art in the work of art now belongs to a set of images. The set the image belongs to has become more important than the image itself. This is the algorithmic revolution in the arts. 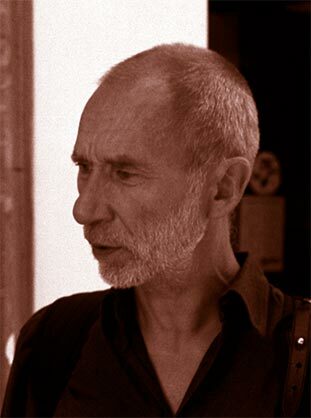 Frieder Nake is a mathematician, computer scientist, critic of artificial intelligence, and pioneer of digital art. He teaches at the University of Bremen and University of the Arts, Bremen. He loves algorithmics and art and both together. Although the concept of algorithms has been established a long time ago, their current topicality indicates a shift in the discourse. Classical definitions based in logic seem to be inadequate to describe their aesthetic capabilities. 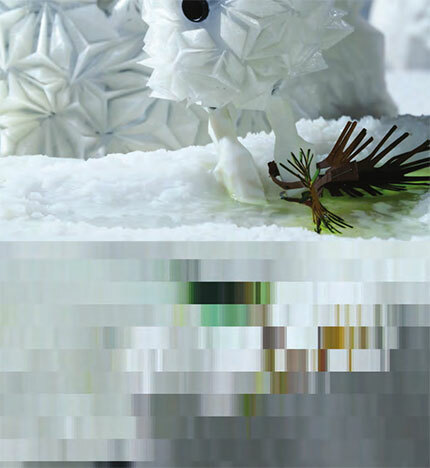 New approaches stress their involvement in material practices as well as their incompleteness. Based on the distinction of form and medium, as known for example in Luhmann’s work, we propose that algorithms are actual forms taken out of a medium we tentatively call algorithmicity. We attempt an observation of defining aspects of such a medium by drawing a trajectory across a number of sound pieces. The operation of exchange between form and medium we call reconfiguration and it is articulated along this trajectory. Under the concept “from the archive to the new” this paper explores the impact of digital computational technology in the way we store, share and transform information in a technologically mediated society. It starts by developing a theoretical investigation on the topic, while addressing a “brief history” of the digitalization of the archive and its consequences. Secondly, it proposes a practical approach to the subject through the development of a digital web-based platform divided in two key moments — archive and program. 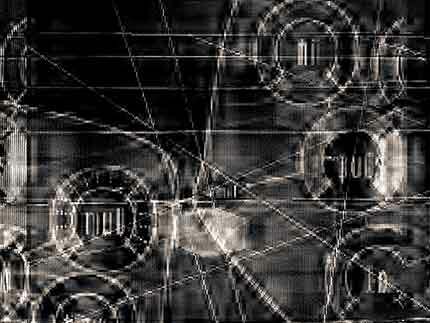 The digital archive gathers projects related to the theoretical investigation. We then create small computational programs in order to transform the stored information into new meaningful piece of information. Finally, we present a framework used as a design methodology to guide the development of these computational programs, seeking to produce results whose expression, meaning and reflection contributes to a renewed view of the archive. Can we effectively describe artworks in informational terms? This paper discusses this question and its ramifications by analysing Mikhail Volkenstein’s (2009) characterisation of art as ‘informational systems’ and contrasting it with contemporary understandings of information and aesthetics. Overall, the paper argues that contrary to Volkenstein’s description, the kind of information conveyed by artworks is not only of an aesthetic kind, since artistic value depends on various other (cultural and economical) aspects. Nonetheless, it concludes that Volkenstein’s description of artworks as ‘programs’ that not only convey but also generate information is a powerful metaphor for addressing current developments in artistic practices. Algorithms primarily belong to the fields of mathematics and computer science. Certainly, the best-known application of algorithms is computer programming. However, algorithmic methods — in the sense of instruction to follow certain rules — have been also used as creative artistic instruments, for example, in modern art movements, such as Fluxus, Conceptual Art or Happening. With this background in mind, this paper aims to explore how algorithmic logic can be implemented in the realm of artistic production by both computer and analog artists. Artists chosen for this investigation include Manfred Mohr, Sol LeWitt, and Hans Arp. Based on the analysis of their works, this paper attempts to establish differences in dealing with algorithms within artificial and human creativity. In this paper, two key features of a framework for active matter (programmable, or rather, “processual” material) that is, programmability and process, are explored via a theoretical and practical discussion. 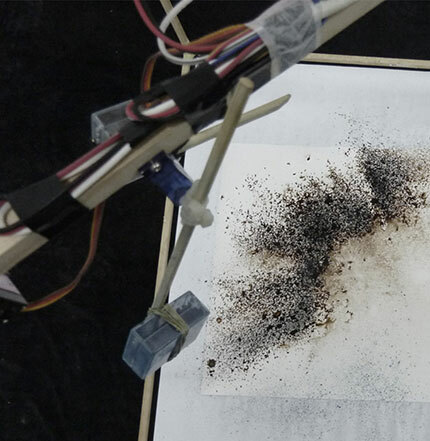 More generally, this paper investigates the concept of materiality and material performance: analysing the experiences of humans in terms of their interaction with the environment, with artefacts and with material within a design context. Finally, the authors propose the conceptual project “Chrysalis Gemini”, applying their perspective on the discourse, meaning and contextualisation of interactive materiality. The aim of “Chrysalis Gemini” is to present the relational potential implied in active materials and their ongoing process of transformation — suggesting a world in a state of flux. Novel computational methods and platforms have opened a new front in psychometrics, the search for measurable personal traits in artefacts created by humans. In particular, texts produced on social media channels have been queried for insights into behavior patterns and sentiment. This text describes an experiment in querying computing platforms that offer psychometric text evaluation. The aim of the project is to reveal some of the dynamics and assumptions hidden in the code underlying computational text analysis. The project suggests “asymmetrical coding” as a practical intervention to build interfaces for opaque deep-learning systems that act outside the direct reach of individuals, yet produce conditions that effect multitudes. Hans Richter’s famous piece Rhythmus 21 is considered to be the first abstract film in the experimental tradition. The Webdriver Torso YouTube channel is composed of hundreds of thousands machine-generated test patterns designed to check frequency signals on YouTube. Could it be argued that, given certain necessary provisions, there exists a lineage connecting Rhythmus 21 and Webdriver Torso? What would it be called? Are we at liberty to discuss the Webdriver Torso channel as an artistic marvel emerging from mathematical abstraction? Virtual Reality (VR) offers new ways to perceive and interact with virtual content. Apart from photo-realism, VR can be used to new ways of visualization and interaction. In this contribution, we describe two student projects, which focused on creating innovative concepts for an artistic VR experience. We provide a review of sources of inspiration ranging from standard NPR-techniques through movies, interactive artworks and games to phenomena of human perception. Based on these wide collection of material we describe the prototypes, and discuss observations during implementation and from user feedback. Finally, possible future directions to use the potential of VR as a tool for novel, artful and unconventional experiences are discussed. The first computer games were mainly multiplayer games, and people were coming together to play them. Although the concept of the multiplayer games shifted towards online multiplayer games, which allows people to play from different locations around the globe, recently the collocated multiplayer games are regaining attention. This paper offers an analysis of collocated multiplayer video games, discussing cases that introduced original interaction modalities. The social relations created within these interaction ecologies have a fundamental role in the history of computer games. To understand how these social relations are conditioned by design choices, five factors have been determined: players’ population, characters’ relationships, control, controllers and screens. These factors constitute a framework which enables designers and researchers to analyse video games from the perspective of collocated gaming. This paper focuses on human performance and its role in the enactment of algorithmic artworks, considering the human body as a medium for artistic creation. It defines procedurality as a core concept in relation to performative practices, while establishing analogies between human and artificial systems. To this end, it discusses performativity as a concept, addressing different understandings of the term, from human performance to the performativity of code and, finally, the interactive performativity of both human and technological systems. It then addresses artistic practices that simulate human performative strategies through computational means, and considers artworks that reverse this logic, by translating computational processes into the physical realm through the human execution of algorithms, and finally, combining the interplay between human and technological systems. Considering these approaches, this study aims to emphasize how procedurality is tied to both human and computational performativity, while also highlighting the human-computer interactive feedback-loop as the performance of the work. This paper contrasts the procedures of science and art by examining the processes of the evolution of thought, and of the context which grounds thought, in both families of disciplines. The decisive difference is the attitude towards reproducibility: in science, reproducibility is sought after, whereas, in contrast, variation (either deliberately produced or arising out of random, uncontrollable processes) is an essential part of the creative process. After reviewing models from logic and programming, which give useful insights into the relation between thought and context, the work of Otto Neurath on the possibly discontinuous evolution of cluster concepts is examined. This body of theory is then applied to music, art and performance, and the relations between them, reflecting upon the current tendency of industrial design and product engineering to construct a smooth, frictionless world inhabited by a fictional being called The User. In this paper I present two different implementations of analogue oscillators that synchronize when they are mutually coupled. I consider these as examples for machine — machine communication without hierarchies and protocols. Synchronization is the most fundamental indicator for the exchange of information. In these analogue oscillators this exchange is realized through a direct coupling, no encoding and no decoding has to be effectuated. Not one oscillator is dominating the communication, they mutually negotiate their timing. This capacity for non-hierarchical communication is a signature of analogue systems. They allow for information exchange without having to recur to symbols or to detect the presence of a signal, already the softest input may modify and modulate the behaviour of an analogue system. Presenting a digital implementation and approximation of an analogue system, this paper is clearly not meant to dismiss digital systems but to open up a perspective on the analogue as conceptual approach towards openness. 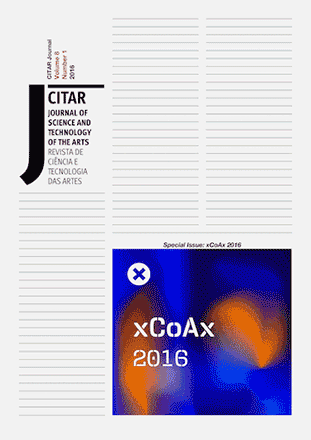 This paper explores the creative potential of the transmutability of digital data, from a theoretical discussion of the concept to its contemporary manifestations in creative practices. It begins by addressing the creative possibilities associated to the topic and then provides an overview of artifacts that imply or express transmutability as an artistic concept and method, while focusing on data sources of a textual nature. To this end, we resort to a framework for the description and analysis of these artifacts, focusing on their conceptual dimension, on their mechanics and on the elements of their experience. In particular, we address the concepts they approach through the use of data in textual formats as source information or content, we consider the processes for its manipulation, and de- scribe the resulting sensory manifestations while emphasizing their dynamics and variability. In this manner, this study seeks to highlight how transmutability becomes relevant as an artistic argument, by proposing aesthetic experiences that explore the ubiquity of data in our contemporary world. This paper outlines the design considerations for the creation of three interactive experiences about the AIDS Memorial Quilt — an extremely fragile work of U.S. cultural heritage. The AIDS Quilt Touch project is a complex media system that includes not only interactive experiences, but also nuanced socio-technical practices to engage audiences in viewing, searching, and annotating the AIDS Quilt. Internet criminals create fake websites that mimic real websites and use them for advance fee fraud or other criminal activities. Over the last ten years members of the vigilante scambaiting community “Artists against 419” maintain the biggest open-access database of fake websites. They use “passive reconnaissance” and “open source intelligence” (osit) tools to gather information to file reports with the hosting provider to get the websites taken off the web. This chapter takes a closer look at the group’s strategies and explains the artistic research installation called “Megacorp.” that visualises a sample probe of 1000 websites from the database collection. This paper seeks to explore how FM radio technology can combine with social and phenomenological interactions to mediate, hybridise and perform a given physical site. Methodologically we propose a novel experimental methodology of creative writing workshops incorporating FM transmitters to stage those interactions. We argue that this workshop may be understood as an act of collective making, exploration and reflection offering a rewarding way to explore and enrich socio-technical ontologies and experiences. Our findings highlight spatial interactions of radio signals with physical and social elements of site as well as participants’ self-identification with technological objects. Printed media have a highly consolidated visual infrastructure. But printed (preponderant) visual part has been wrongly considered as coinciding with its whole. That is why they have been recently massively translated into another universal medium (the digital) through a direct process. What is missed, much more than nostalgia, is a small perceptual universe that is instinctually unfolded every time the physical medium is used, while it is misdirected if not negated in its new screen- based embodiment. The Drawbox Project is a children-oriented, interactive audio-visual installation. Visitors are invited to draw colourful sketches on paper and then use the Drawbox — a special workstation installed at the exhibition space — to deliver their drawings into a dynamic physically-simulated world. Participants witness their drawings come to life, as shapes receives real-world physical properties, propel in motion and collide with drawn shapes of other participants in an imaginary drawn world. When two DrawBoxes are installed in remote locations, the drawn shapes from both locations are presented in a shared world, creating an ambient, creative connection. We describe the development and deployment of the DrawBox in two locations simultaneously. This paper introduces Prefalll135 , an interactive installation that uses the kinetic energy of falling water to generate real time visuals and sound. It consists of a tangible user interface of water- mills and taps, which enables users to control the water’s flow. The angular velocity of each watermill is mapped to parameters of the audiovisual system, permitting the users to create dynamically their own collaborative or solo audiovisual composition. Prefalll135 integrates both Do-It-Yourself practices, regarding the construction of the physical interface through means of personal fabrication, as well as Do-It-With-Others practices, respecting the collaborative development processes employed and the extension of the use-value produced by open-source communities. Being a project inspired by nature, Prefalll135 fosters the concept of reuse and free access to resources, both in digital and physical spheres. This paper describes a sound installation designed to increase our aural awareness of animal sounds, aiming to reinstate our natural connection to our own habitat. Based on casual, semantic and reduced listening modes, we developed a sound installation that presents creative aural experiences to enhance our connection to the natural soundscapes by recreating lost or forgotten environments, thus contributing to the preservation of sound memory in the contemporary world. This paper explains the concept and implementation of the installation and offers a discussion of the role of listening in our society and strategies to make it a more conscious act. iAm is an online shortfilm editing engine that generates pseudo-infinite instances of a same story. This artistic artefact can be considered a working prototype that serves as a proof of a concept. Its artistic aim is to point out the relationship between humans and machines by letting the software make decisions during the editing process. The technical implementation becomes an experiment to test the importance of narrative patterns and structures of specific ways to formalise a story, while at the same time it questions the idea of final cut, authorship and finished work. It is a multidisciplinary project that involves UX design, software development and film shooting. The artefact becomes a formalization of several ideas. Living Mandala is an exploration in uncharted territories of the human soul sculpted by our present time. This interactive revolving graphical system visualizes our perceptions of life (microcosm) and the universe (macrocosm), our connections to ancient mythology, cosmology, and cultural heritage, and the relationships among humankind, science, technology, and nature in a globalized society. Nero ipogeo is the third of my acousmatic cycle of compositions dedicated to the colour “nero” (the first one “Nero metropolitano”  and the second “Nero siderale”  are published on a CD edited by Taukay Edizioni Musicali). It is mainly designed with the open source software Supercollider. 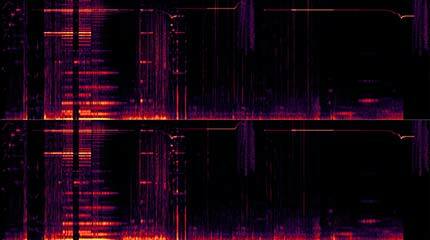 The sources of Nero ipogeo are audio gestures of high frequencies (not dissimilar to the whistle) and underground sounds on the verge of audibility or inaudibility. The principle of the compositional fragmentation and of the compositional reduction is taken to the absolute estreme. I sculpted a kind of sub-atomic composition that pick up the sounds from the crevices between one quantum event and the next one. The intention is to lead the listener to the most attentive and perceptive kind of listening. Megacorp. is a corporate conglomerate inspired by its equally powerful counterparts in science fiction. The artwork is based on a collection of fraudulent websites scraped from the internet. Theorem 8.1 is a 3-channel video installation exploring the artistic possibilities of the mathematical concept of orthogonal projection. Every frame in Godard’s film Alphaville is decomposed and reconstructed four times, using different sets of frames extracted from the same film. A procedural poem algorithm, assembling Elizabethan sonnets automatically using text from Wikipedia. 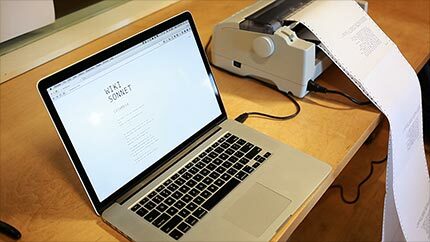 Wikisonnet uses machine methods to assemble lines of human composed text, creating work that is part algorithmic and part manmade. Design by Tweet enables Twitter users to collaboratively code visual compositions by writing tweets that use a simple Processing-inspired API. Twitter users can participate by sending a specially formulated tweet to @designbytweet. In response, this account will automatically post an image of the composition after executing the user’s commands. The Design by Tweet name mirrors that of Design by Numbers, one of John Maeda’s projects at the MIT Media Lab in the 1990s. LASACT is a temporary,interactive Light and Sound-Installation. 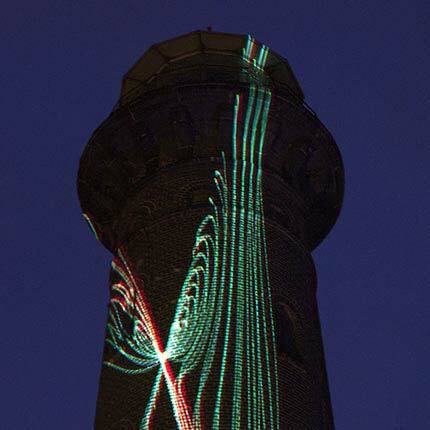 Visitors are able to modify the visual appearance and sound patterns by using a web application for mobile devices. Chaotic and harmonious lines alternate while visitors are taking control of the installation. The installation NarcissUs is a critical and artistic approach towards the development of intelligent machines. The main goal is to unfold the emergent results that the learning process from artificial beings in mixed reality environments can encounter. 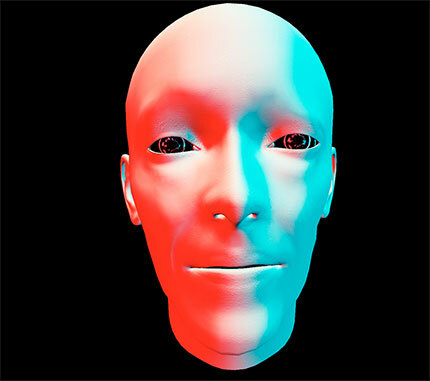 It consists of a feedback loop between a computer generated portrait (NarcissUs), a camera, a moving mirror, a face recognition algorithm and an evolving learning machine seeking for self awareness. NarcissUs searches for its reflection, learns from it and evolves through expressive exchanges. The installation is a metaphor from the mirror-stage and the moment of self recognition, which is recognised by Lacan as an essential act of intelligence. Whether this act is also a symptom of consciousness or not, is open to discussion. NarcissUs intends to argue, to which extend can an artificial system be perceived as self-aware. 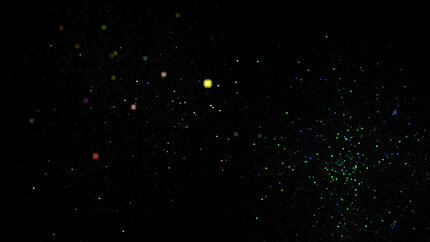 Nightfields (2016) is an immersive audiovisual installation. The work explores how movement, induced by natural forces, can be used to propagate audiovisual phenomena. Beyond the Liveness is an exhibition based on the live audiovisual performance Shipwreck scored by INIRE. Its concept concerns mutual interdependencies between genres as live performance and audio and video installation, in the context of the discourse about performance and its documentation. The exhibition is composed of three parts: hardware DVD player with video documentation of the performance; audio video installation with multi channel audio stream based on the performance; a google questionnaire about liveness issue. What if we were able to find a conversation rather than a person? 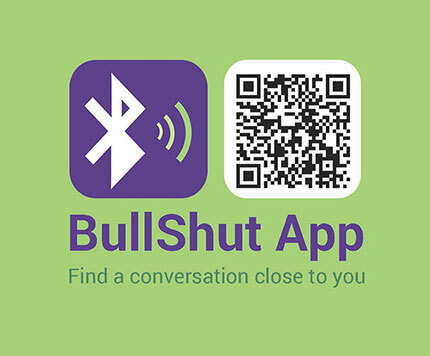 BullShut App is a mobile phone application, which aims to avoid awkward moments at any sort of social events. Its main purpose is to create a conversational space among two individuals during a brief period of time. Typing your chosen topic would allow you to find the rest of users, and to be found by them. The final purpose is finding and establishing a direct conversation, avoiding the step of interacting with people, whom we do not have anything in common with. 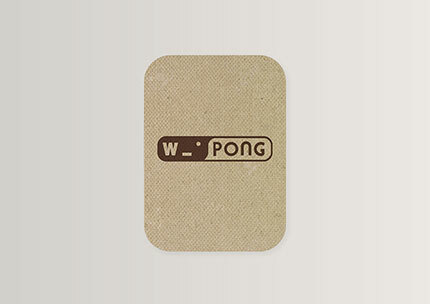 WiPong is a massive multiplayer version of the Atari Pong video game available to mobile devices in the range of a WiFi signal. WiPong explores the limits of multiplayer gaming in collocated environments contrasting with the common experience of online games. 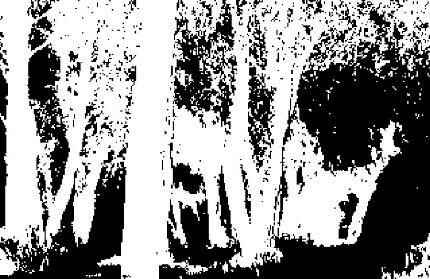 Dark Path #2 is an acousmatic piece of electroacoustic music. The sounds used in the piece, processed, then "composed" together to create the musical work, were recorded in a soundscape dear to author, located in the Italian region of Marche. "Dark Path #2" can be defined as a journey through light, shadow, shape, color, drifts and landings. 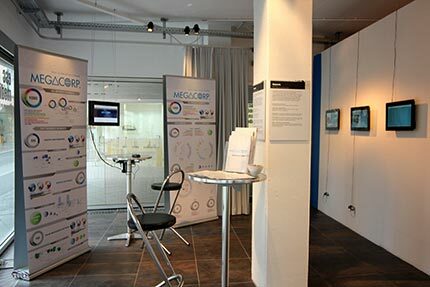 Tweeting Antennas explores the relationship between new and old media in public spaces. 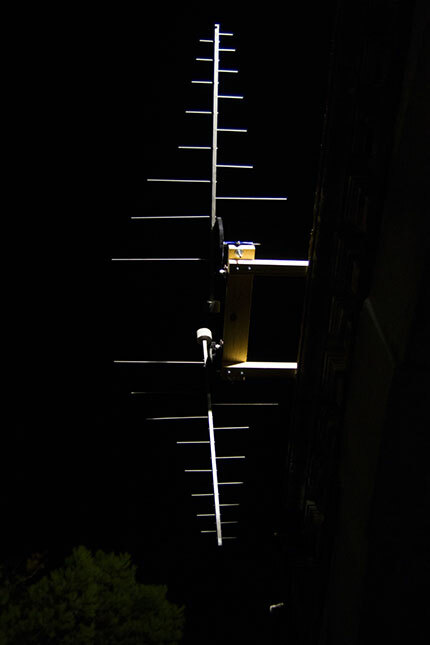 It renders visible the digital communication processes that are usually invisible, by translating geolocated tweets into the Flag Semaphore System, through the real-time movement of a modified rooftop TV antenna. NESL is a short film which queries sensation, effect and the relational potentials between multiple discrete yet entangled non-human agents occupying a defined space. This work borrows heavily from recent post human philosophical thought including speculations on computational phenomenology. In this project we speculate on several distinct sensate embodiments entangled together including a crystal gardening robot species entitled NESL which develop an aesthetic motivation to participate within their dynamic synthetic environment. Click Click Sale is an audiovisual piece that explores the obscure phenomenology of online advertising together with its reliance on people, needs, dynamisms, and communication patterns. The piece relies on data sonification and visualization to expose beauty and emerging aesthetics in data collected by online advertising systems, discovering their inherent social and socially connected layers. Wireless network auditing hardware and software, public web interface (dimensions variable). 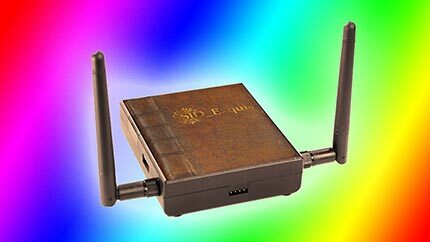 SSID_Exquis is a gamified exercise in collaborative poetry, manifested in WiFi. Its participants can publicly broadcast wireless network names, or SSIDs, by contributing to a collectively assembled list. From this list a series of wireless LAN beacon frames is generated which are transmitted periodically to announce their presence in the surrounding 802.11 radio spectrum. In a continuous fashion the resulting flood of publicly accessible wireless networks is logged, constituting timestamped cadavres exquis. s.laag is a piece composed for Dutch Bass Clarinettist Marij Van Gorkom, as part of the http://dutch-uk.network project. This interactive media work employs sonic path-finding techniques and game-audio tools to explore the concept of "modular metaphor". It navigates across the intersections between the Real, the Virtual and the modular augmentation of a musical instrument. The Dutch word 'laag' means low but also layer, stratum and thickness, which resonate more with the compositional thinking behind this work. Slaag (pass in Dutch language) evokes the sonic fluxus between the acoustic instrument and the electronic medium. Continua is a duet for cellist and live coder, each playing a hybrid instrument based on the Halldorophone, an electroacoustic instrument in which electronically-induced feedback can be finely controlled. The physical interface is that of a classical cello, affording a traditional gestural performance practice which is disrupted by the nonlinearities of the resonant feedback; the electronic interface allows for remote intervention and performance via live-coding; the two practices meet via acoustic coupling of the adjacent physical instruments in close proximity. 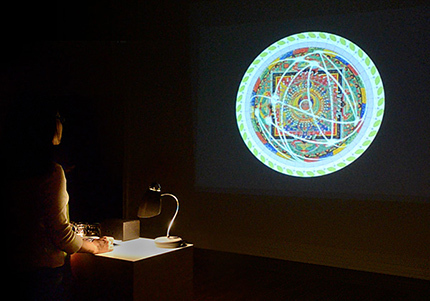 Seven Sphere Journey is a performance centered around new sound-synthesis based on the 8-dimensional octonion algebra. A 7-dimensional surface of a sphere exists in the 8-dimensional space, hence the name. The abstract electronic music is accompanied by physical dance theater here in our 3-dimensional reality. Anemone Actiniaria is an algorithmic improvisation duo by Hanns Holger Rutz and David Pirrò. In it, they couple two specially developed computer systems through signal exchange. Mutual observation and overwriting is initiated between our systems, Wolkenpumpe and Rattle, rooted in physical modelling and in the generation of parametric models based on machine learning.